"The Challenge of Credit Card Debt for the African American Middle Class," a new report by think tank Demos and the National Association for the Advancement of Colored People, revealed significant differences between how black and white members of the middle class use their plastic. It also explored why that should be, and the different problems each group encounters. Taken as a whole, black people in America have many fewer assets per head than the white population. The study cites 2011 data from the Pew Research Center that found, on average, whites having $20 of wealth for every $1 held by a black person. Worse, a much higher proportion (half) of African-American wealth is invested in housing, which is often illiquid: When a homeowner is suddenly faced with financial strain, home equity is difficult to access in a hurry. And, of course, the recent home-price crash meant that many -- black and white alike -- lost the equity they had in their homes as plummeting prices saw the value of their properties dip below the amount still owed on their mortgages. Clearly, with their greater dependence on home equity, this hit black households disproportionately. But it wasn't only in this respect that recent economic events have disadvantaged middle-class black people. "Over the five years since the financial crisis African-Americans experienced the greatest economic losses of any group in the country, including the highest unemployment rates and the biggest drops in annual income," says the report. In 2010, the household income of black families was on average 61 percent of that of white ones, according to Economic Policy Institute data cited in the report. Given that background, it's perhaps surprising that black people use their credit cards to make up a shortfall in their checking and savings accounts only about as often as those in other communities, including the white one. Forty-two percent pay at least sometimes for day-to-day living expenses (food, utilities, rent, mortgage payments and so on) by charging those to their plastic. Maybe equally surprisingly in those circumstances, those black people who have credit card debt are paying it down, reducing their average balance in 2013 to $5,784, compared to the $6,671 found in a similar Demos/NAACP survey in 2008. That's a fall of 13.3 percent, which isn't far off the drop of 14.8 percent seen in the Federal Reserve's national consumer credit figures for revolving credit (which is nearly all credit card debt) between 2008 and October 2013. One area of divergence arises over entrepreneurship. Nearly all the black respondents to the Demos/NAACP survey who'd started a new business charged some of the expenses to their credit cards. 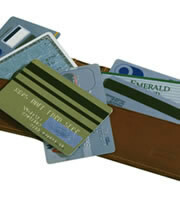 A whopping 99 percent are still paying down those expenses on their current card statements. That compares with 80 percent of white founders of new businesses. African-Americans are also willing to fund improving their children's life chances using their plastic. Half of indebted black households that had spent any money on their kids' college educations reported they were still paying down some of those expenses on their current card statements. "The African-American middle class is more likely to have to use credit cards to finance investments in their future because they have fewer assets to fall back on relative to other households," Catherine Ruetschlin, co-author of the report, suggested. By many standards, black households are as creditworthy as white ones. There aren't any significant differences between the two when it comes to rates of home repossession, eviction from rented accommodation, bankruptcy or late card payments. And yet middle-class black people tended to have lower credit scores. Only 66 percent of black survey respondents said their credit scores were 620 or above, compared with 85 percent of white respondents. Similarly, 74 percent of white households described their credit as good or excellent, while only 42 percent of black ones claimed the same. This may explain why those black households that have debt on their plastic pay higher credit card rates on average (17.7 percent APR) than similarly indebted white ones (15.8 percent APR). When asked why their credit scores were low, black people tended to blame late student loan payments (40 percent) or errors on their credit reports, while white people more often cited late mortgage payments and using too large a proportion of their available credit. Banning employers and prospective employers from making credit checks, especially when hiring or promoting. Reforming bankruptcy laws to make it possible for judges to discharge student debt, and restructure mortgages more fairly. Nationally capping usurious rates, and further limiting fees charged by credit card companies for late payments. Regulating to reduce the incidence of errors on credit reports. You might think that the chances of any of these being enacted any time soon are currently close to zero. 0 Responses to "Report focuses on African-American credit card use, debt"